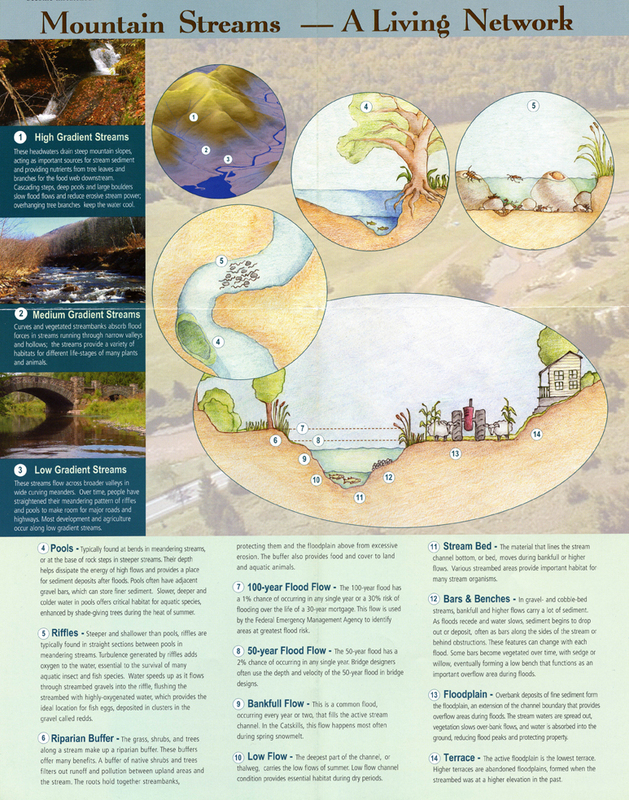 This page contains an introductory lesson about stream and floodplain processes and functions. Below are brief summaries with more detailed information in the links provided. WHY ARE CATSKILL MOUNTAIN STREAMS IMPORTANT? Our Catskill streams are more than aesthetic wonders and resources for recreation. They perform important environmental functions and services, including providing the lifeblood of countless organisms – including humans, plants and animals – to draining floodwaters and moving rock and soil eroded from the mountains to build fertile valleys. These functions are complex and interrelated. The stream is a dynamic feature of the landscape, ready to swell in a heavy rainstorm or shrink to a trickle during a drought. Understanding these relationships is vital to well-informed living near our streams. Streams drain the landscape. When rain falls or snow melts, water that doesn’t seep into the ground becomes runoff. This runoff drains into a network of streams, brooks, creeks and rivers. Along this network, stream channels shape themselves to carry the high water of spring snow melt. Flows that exceed the stream channel’s capacity become floods, which can range from minor events to raging torrents that carve new channels. The floodwater is routed down the valley across the floodplains, which play an important role in a watershed’s drainage system. By dissipating the water’s erosive energy, floodplains help keep stream channels stable and able to carry regular daily flows. Streams shape the land. From small creeks to meandering rivers, streams are the great sculptors of the Catskill Mountain landscape. Streams move sediment of all sizes and deposit this load downstream and across floodplains. Fine sediment like clay can be carried along for miles in moderate flows, while boulders make their way downstream only during rare flood events. Streams also process sediment during transport –– boulders break into cobbles, cobbles are crushed into gravel, and gravel is ground into sand. By eroding, transporting, and depositing sediment, Catskill streams perform the geologic wonder of transforming mountains into fertile valleys. Water sustains all life. The water flowing in Catskill streams not only supports wildlife and plants, but it also quenches the thirst of millions of people who drink it daily. Brook trout rest in the pools of creeks; stoneflies emerge from their nymph casings on boulders above the swirling water; a great blue heron wades the shallow riffle looking for dinner; a deer drinks from a pool; a child drinks from a New York City fountain. Monitoring and protecting the quality of this essential substance ensures that cool, clean water is the precious resource passed on to future generations. > Streamside Protection: Why Bother?